This Christmas we’re celebrating the joy of being together. Share photos and videos of how you’re spending #ChristmasTogether for the chance to win some amazing festive prizes for you and a loved one. 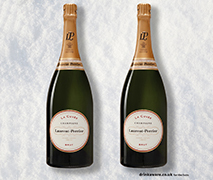 Celebrate in style and enjoy #ChristmasTogether with a magnum for you and a friend to toast the festive season. 1. This promotion is open to all United Kingdom residents (excluding residents of Northern Ireland and the Channel Islands) aged 18 or over as of their date of entry. The winner of the the prize and all recipients must also be aged 18 or over. i) Twitter - share a photo or video on Twitter using both the #ChristmasTogether hashtag and @waitrose handle. ii) Instagram - share a photo or video on Instagram using both the #ChristmasTogether hashtag and @Waitrose handle. iii) Facebook - add a comment on Waitrose’s dedicated #ChristmasTogether competition posts on Facebook, including your photo or video. Please note: In accordance with Facebook terms of service and privacy laws, we will not be able to see entries from people with strict privacy settings on Facebook. Therefore, to be eligible to receive a prize, Facebook users must leave a comment when prompted on Waitrose Facebook posts that refer to the promotion. Those entering are advised to ‘Like’ Waitrose on Facebook and check their Facebook notifications from 10am Tuesday 19 December 2017. 3. If entering via Twitter or Instagram you will receive an automated message to ask for your entry to be considered for a compliation video to be published on Facebook and Twitter. Opting in you consent to your entry being used. Due to technical reasons, Facebook entries are exempt from the video. 5. Entries must be made between 10am on Monday 18 December 2017 to 10am on Tuesday 19 December 2017. 8. The winner will be selected at random from all eligible entries received throughout the promotional period. Entries received after the closing date cannot be considered. 9. Participants must provide to the Promoter, when requested, documentary proof of their age and/or residency status. Failure to meet these criteria shall result in instant disqualification from the Promotion including receipt of any prize. 10. All entries must be submitted by 10am on Tuesday 19 December 2017. Illegible entries or those not in accordance with the rules will be disqualified. No responsibility will be accepted for any entries that are incomplete, invalid or fail to be properly submitted. Proof of sending will not be accepted as proof of receipt. The promoter and their agents accept no responsibility for difficulties experienced in submitting an entry to this promotion. 11. The winners will be notified by the means they entered e.g. direct reply on Twitter, or a reply to their Facebook comment or Instagram post by 2pm on Wednesday 20 December 2017. All reasonable effort will be made to contact the winners, however, if the promoter is unable to contact a winner within 24 hours, an alternative winner may be chosen, subject to the same terms and conditions specified herein. Those entering are advised to ‘follow’ Waitrose on Twitter, Facebook and Instagram and check their notifications from 2pm on Wednesday 20 December 2017. 12. Prizes will be sent within 1 day once confirmation of the winner’s full name and UK postal address has been received. It is the winner’s responsibility to share the prize and organise the logistics with their designated friend/ family member. 13. If a winner of the prize is unable to take up the prize for any reason, the promoter reserves the right to award it to an alternative winner, in which case the first winner chosen will not be eligible for any share of the prize whatsoever. 14. No cash alternative will be offered and no royalties will be given to the winners of the competition. The promoter reserves the right to substitute the prize with one equivalent or of greater value. Waitrose and partners accept no liability for any loss, damage or injury caused by any prizes won. 15. The Promoter may look to feature selected entries, photos and videos in promotional materials, including social media content and on waitrose.com. In this case, the Promoter will seek approval from the entrant via the social media channel they submitted their entry on. Upon approval, these entrants grant Waitrose a royalty-free, perpetual, irrevocable licence (with the right to sub-license) in the Territory of Provider's Intellectual Property Rights. 16. If events occur that render the promotion or the awarding of the prize impossible due to reasons beyond Waitrose’s reasonable control, it may, at its discretion, vary or amend the promotion accordingly and the promoter reserves the right to provide an alternative prize of equal or greater value in such circumstances. 17. The promoter reserves the right to withdraw or amend this promotion in the event of any unforeseen circumstances outside their reasonable control. 18. The promoter reserves the right to terminate or temporarily suspend this promotion in the event of technical or other difficulties that might compromise its integrity. 19. This promotion and these terms are governed by English law and subject to the exclusive jurisdiction of the English Courts. 20. Waitrose and partners are responsible for the promotion, which is the publication and adjudication of the competition. 21. We will never release your personal details to any company outside the John Lewis Partnership for mailing or marketing purposes, unless you opt-in to receive information and offers. In this instance, personal details are used for the purposes of awarding the competition prizes only. 22. The promotion is in no way sponsored, endorsed or administered by, or associated with, Instagram, Facebook or Twitter. You understand that by entering the competition you are providing your information to Waitrose and not to Instagram, Facebook or Twitter. 23. You must comply with all of the rules regarding the use of Instagram, Facebook and Twitter including, but not limited to, any rules relating to the entry of promotions. 24. By entering the promotion you release instagram, Facebook and Twitter from any action or claim arising out of the promotion. Any questions, comments or complaints regarding the promotion must be directed to Waitrose and not Instagram, Facebook or Twitter..
25. Entrants are deemed to have accepted these terms and conditions by participating in this promotion. Please note: In accordance with Facebook terms of service and privacy laws, we will not be able to see entries from people with strict privacy settings on Facebook. Therefore, to be eligible to receive a prize, Facebook users must leave a comment when prompted on Waitrose Facebook posts that refer to the promotion. Those entering are advised to ‘Like’ Waitrose on Facebook and check their Facebook notifications from Thursday 16 November 2017. 5. Entries must be made between 10am on Tuesday 14 November 2017 to 10am on Thursday 16 November 2017. 6. There will be 1 winner. The prize consists of 1x Exclusive ‘Chocolate & Cherry Yule Log’ class at Kings Cross Cookery School, Thursday 21 December, 6.30pm - 8.30pm for up to 20 people. 10. All entries must be submitted by 10am on Thursday 16 November 2017. Illegible entries or those not in accordance with the rules will be disqualified. No responsibility will be accepted for any entries that are incomplete, invalid or fail to be properly submitted. Proof of sending will not be accepted as proof of receipt. The promoter and their agents accept no responsibility for difficulties experienced in submitting an entry to this promotion. 11. The winners will be notified by the means they entered e.g. direct reply on Twitter, or a reply to their Facebook comment or Instagram post by 2pm on Friday 17 November 2017. All reasonable effort will be made to contact the winners, however, if the promoter is unable to contact a winners within 48 hours, an alternative winner may be chosen, subject to the same terms and conditions specified herein. Those entering are advised to ‘follow’ Waitrose on Twitter, Facebook and Instagram and check their notifications from 2pm on Friday 17 November 2017. 12. The winner must be available on Thursday 21 December. If a winner of the prize is unable to take up the prize for any reason, the promoter reserves the right to award it to an alternative winner, in which case the first winner chosen will not be eligible for any share of the prize whatsoever. 13. No cash alternative will be offered and no royalties will be given to the winners of the competition. The promoter reserves the right to substitute the prize with one equivalent or of greater value. Waitrose and partners accept no liability for any loss, damage or injury caused by any prizes won. 14. The Promoter may look to feature selected entries, photos and videos in promotional materials, including social media content and on waitrose.com. In this case, the Promoter will seek approval from the entrant via the social media channel they submitted their entry on. Upon approval, these entrants grant Waitrose a royalty-free, perpetual, irrevocable licence (with the right to sub-license) in the Territory of Provider's Intellectual Property Rights. 20. We will never release your personal details to any company outside the John Lewis Partnership for mailing or marketing purposes, unless you opt-in to receive information and offers. In this instance, personal details are used for the purposes of awarding the competition prizes only. 21. The promotion is in no way sponsored, endorsed or administered by, or associated with, Instagram, Facebook or Twitter. You understand that by entering the competition you are providing your information to Waitrose and not to Instagram, Facebook or Twitter. 22. You must comply with all of the rules regarding the use of Instagram, Facebook and Twitter including, but not limited to, any rules relating to the entry of promotions. 23. By entering the promotion you release instagram, Facebook and Twitter from any action or claim arising out of the promotion. Any questions, comments or complaints regarding the promotion must be directed to Waitrose and not Instagram, Facebook or Twitter..
You and a friend can be fully prepared for Stir-up Sunday with two Candy Apple KitchenAid 4.8L Stand mixers. 5. Entries must be made between 10am on Tuesday 21 November 2017 to 10am on Thursday 23 November 2017. 6. There will be 1 winner. 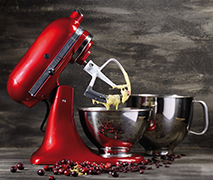 The prize consist of 2x Candy Apple KitchenAid 4.8L Stand mixers. 10. All entries must be submitted by 10am on Thursday 23 November 2017. Illegible entries or those not in accordance with the rules will be disqualified. No responsibility will be accepted for any entries that are incomplete, invalid or fail to be properly submitted. Proof of sending will not be accepted as proof of receipt. The promoter and their agents accept no responsibility for difficulties experienced in submitting an entry to this promotion. 11. The winners will be notified by the means they entered e.g. direct reply on Twitter, or a reply to their Facebook comment or Instagram post by 2pm on Friday 24 November 2017. All reasonable effort will be made to contact the winners, however, if the promoter is unable to contact a winners within 24 hours, an alternative winner may be chosen, subject to the same terms and conditions specified herein. Those entering are advised to ‘follow’ Waitrose on Twitter, Facebook and Instagram and check their notifications from 2pm on Friday 24 November 2017. 12. Prizes will be sent within 5 days once confirmation of the winner’s full name and UK postal address has been received. It is the winner’s responsibility to share the prize and organise the logistics with their designated friend/ family member. 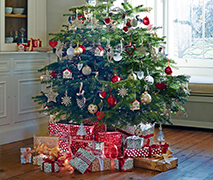 Deck the halls with a freshly cut Nordman Fir delivered directly to your door, complete with a bundle of Christmas Tree decorations, this week’s prize will help you get started with the festive, decorating fun. 1. This promotion is open to all United Kingdom residents (excluding residents of Northern Ireland, the Channel Islands and the Scottish Highlands) aged 18 or over as of their date of entry. The winner of the the prize and all recipients must also be aged 18 or over. Please note: In accordance with Facebook terms of service and privacy laws, we will not be able to see entries from people with strict privacy settings on Facebook. Therefore, to be eligible to receive a prize, Facebook users must leave a comment when prompted on Waitrose Facebook posts that refer to the promotion. Those entering are advised to ‘Like’ Waitrose on Facebook and check their Facebook notifications from 10am Thursday 30 November 2017. 5. Entries must be made between 10am on Tuesday 28 November 2017 to 10am on Thursday 30 November 2017. 6. There will be 1 winner. The prize consist of a 2x 6ft/7ft/8ft Fresh cut Nordman Christmas trees and Waitrose Christmas tree decorations bundle. 2ft/3ft pot grown trees will also be available if necessary. 7. Given the nature of the prize, the tree and decorations will be delivered by separate couriers to both recipients. Waitrose will liaise with the winner directly to organise a delivery day(s) of their convenience. Prizes will be sent within 5 days once confirmation of the winner’s full names and UK postal addresses have been received. 9. No automated, third party or bulk entries permitted. Entrants can enter more than once. 10. The winner will be selected at random from all eligible entries received throughout the promotional period. Entries received after the closing date cannot be considered. 12. All entries must be submitted by 10am on Thursday 30 November 2017. Illegible entries or those not in accordance with the rules will be disqualified. No responsibility will be accepted for any entries that are incomplete, invalid or fail to be properly submitted. Proof of sending will not be accepted as proof of receipt. The promoter and their agents accept no responsibility for difficulties experienced in submitting an entry to this promotion. 13. The winners will be notified by the means they entered e.g. direct reply on Twitter, or a reply to their Facebook comment or Instagram post by 2pm on Friday 1 December 2017. All reasonable effort will be made to contact the winners, however, if the promoter is unable to contact a winners within 48 hours, an alternative winner may be chosen, subject to the same terms and conditions specified herein. Those entering are advised to ‘follow’ Waitrose on Twitter, Facebook and Instagram and check their notifications from 2pm on Friday 1 December 2017. 23. The promotion is in no way sponsored, endorsed or administered by, or associated with, Instagram, Facebook or Twitter. You understand that by entering the competition you are providing your information to Waitrose and not to Instagram, Facebook or Twitter. 24. You must comply with all of the rules regarding the use of Instagram, Facebook and Twitter including, but not limited to, any rules relating to the entry of promotions. 25. By entering the promotion you release instagram, Facebook and Twitter from any action or claim arising out of the promotion. Any questions, comments or complaints regarding the promotion must be directed to Waitrose and not Instagram, Facebook or Twitter.. 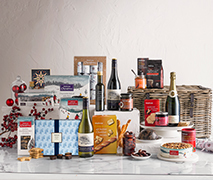 Packed with irresistible food and drink, enjoy a delicious luxury food hamper and fill your cupboards with treats. In the spirit of #ChristmasTogether you will also get another for gift to a loved one that we can deliver directly to their door. Please note: In accordance with Facebook terms of service and privacy laws, we will not be able to see entries from people with strict privacy settings on Facebook. Therefore, to be eligible to receive a prize, Facebook users must leave a comment when prompted on Waitrose Facebook posts that refer to the promotion. Those entering are advised to ‘Like’ Waitrose on Facebook and check their Facebook notifications from 10am Thursday 7 December 2017. 5. Entries must be made between 10am on Tuesday 5 December 2017 to 10am on Thursday 7 December 2017. 6. There will be 1 winner. The prize consist of: 2x Waitrose Luxury Christmas Hamper. Contents includes: Waitrose Brut NV Champagne 75cl; Porcupine Ridge Syrah 75cl; Porcupine Ridge Sauvignon Blanc 75cl; Waitrose Christmas Dundee Cake; Waitrose Christmas Panettone; Waitrose Richly Fruited Christmas Pudding 454g; Waitrose Swiss Praline Assortment 210g; Waitrose Christmas Chocolate Biscuit Selection 450g; Waitrose Christmas Shortbread Stars 130g; Waitrose all butter Cheddar Cheese Twists 125g; Waitrose Nigella Seed Biscuits for Cheese 150g; Waitrose Onion & Garlic Chutney 340g; Waitrose Morello Cherry Extra Fruit Preserve 340g; Waitrose Seville Orange Fresh Fruit Marmalade 340g; Waitrose Christmas Assorted Turklish Delight 200g; Waitrose Chocolate Fruit & Nut Selection 200g; Waitrose Whole Kalamata Olives 300g; Waitrose Extra Virgin Olive Oil 250ml; Waitrose Luxuriously Rich Drinking Chocolate 250g; Waitrose Americano Blend Ground Coffee 227g; Waitrose Assam Loose Leaf Tea 125g; Waitrose Christmas Crackers 25cmx8. 10. All entries must be submitted by 10am on Thursday 7 December 2017. Illegible entries or those not in accordance with the rules will be disqualified. No responsibility will be accepted for any entries that are incomplete, invalid or fail to be properly submitted. Proof of sending will not be accepted as proof of receipt. The promoter and their agents accept no responsibility for difficulties experienced in submitting an entry to this promotion. 11. The winners will be notified by the means they entered e.g. direct reply on Twitter, or a reply to their Facebook comment or Instagram post by 2pm on Friday 8 December 2017. All reasonable effort will be made to contact the winners, however, if the promoter is unable to contact a winners within 48 hours, an alternative winner may be chosen, subject to the same terms and conditions specified herein. Those entering are advised to ‘follow’ Waitrose on Twitter, Facebook and Instagram and check their notifications from 2pm on Friday 8 December 2017. 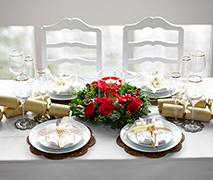 Set a perfectly festive table and enjoy our hand-picked selection of Waitrose goodies. Celebrate #ChristmasTogether and gift the very same package to a loved one to help them prepare for the festive season. Please note: In accordance with Facebook terms of service and privacy laws, we will not be able to see entries from people with strict privacy settings on Facebook. Therefore, to be eligible to receive a prize, Facebook users must leave a comment when prompted on Waitrose Facebook posts that refer to the promotion. Those entering are advised to ‘Like’ Waitrose on Facebook and check their Facebook notifications from Thursday 14 December 2017. 5. Entries must be made between 10am on Tuesday 12 December 2017 to 10am on Thursday 14 December 2017. 7. Given the nature of the prize and to guarantee freshness, the Waitrose Florist centrepiece will be delivered by a separate courier to both recipients. Waitrose will liaise with the winner directly to organise a delivery day(s) of their convenience. 12. All entries must be submitted by 10am on Thursday 14 December 2017. Illegible entries or those not in accordance with the rules will be disqualified. No responsibility will be accepted for any entries that are incomplete, invalid or fail to be properly submitted. Proof of sending will not be accepted as proof of receipt. The promoter and their agents accept no responsibility for difficulties experienced in submitting an entry to this promotion. 13. The winners will be notified by the means they entered e.g. direct reply on Twitter, or a reply to their Facebook comment or Instagram post by 2pm on Friday 15 December 2017. All reasonable effort will be made to contact the winners, however, if the promoter is unable to contact a winners within 48 hours, an alternative winner may be chosen, subject to the same terms and conditions specified herein. Those entering are advised to ‘follow’ Waitrose on Twitter, Facebook and Instagram and check their notifications from 2pm on Friday 15 December 2017.